Goodbye Little French Mother, this Norman Rockwell painting, appeared on the cover of Life Magazine published March 13, 1919. 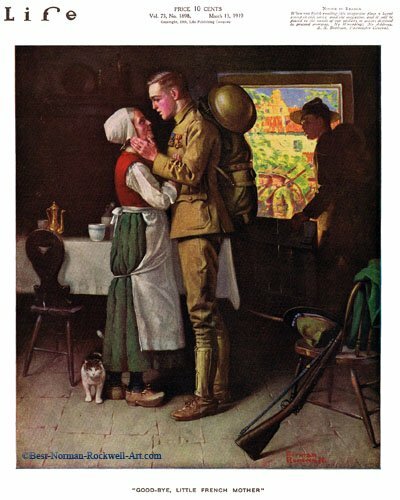 An alternate title for this illustration is Soldier Saying Farewell to French Family. This was the fifteenth cover by Rockwell to appear on Life Magazine. A Rockwell painting appeared on Life magazine's cover only twice in 1919 and twenty-eight times in all. This painting also appeared on the cover of sheet music also published in 1919. The song, Little French Mother, Good-bye!, was written by Jack Caddigan and Chick Story. This decorated American soldier has stopped by his home away from home to say goodbye. This French woman has been his "mother" while he was stationed in France. The emotions Norman Rockwell presents in this painting are very intense. Just look at the expression on the soldier's face. He will truly miss her. The woman is touched by the his feelings for her. A slight smile is crossing her face. Looking out the open top half of the door, we can observe soldiers marching in formation through the village. The soldier's buddy is opening and stepping through the door. He turns as if to say "Let's go, we're getting left behind." The only thing good about saying goodbye to this "mother" is that when he gets home, his other real mother will be saying "Hello, son.